She is attractive, dresses well – but has been criticised for wearing designer clothes – and speaks with a low, for a female, penetrative voice. Forty-six years old unmarried but in a relationship with hair products salesman Tim Mathieson Julia Gillard imposes herself on any company she is in, including Parliament where she is a consummate performer and especially in television interviews. Born in Wales in 1961 but moved to Adelaide South Australia in 1966 she graduated from Unley High school in 1978 and attended Adelaide University but later moved to Melbourne where she obtained degrees in law and arts then joined a prestigious law firm, eventually becoming a partner. She joined the staff of the Victorian Labor Opposition Leader and entered Federal Parliament as the member for Lalor in 1998. She fulfilled various shadow portfolios eventually become Deputy Leader in December 2006 after being considered in some quarters as leadership material. Many women who enter parliament leave the rough stuff to the boys. 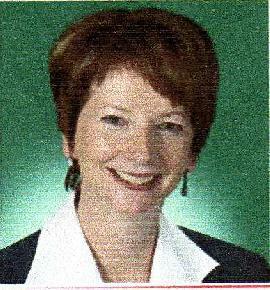 Not Julia Gillard, in fact she has become Labor's best heavy hitter both in Parliament and the media. If a strong attack is needed she is usually the one to get in and mix it with the big boys. For someone with so many achievements it seems strange that in the coffee shops and buses she is not more universally admired. I can't even repeat some of the comments I've heard. There can be only one reason, she is a strong women and that makes both men a women uncomfortable. In fact, the biggest critics of women are more often than not other women. Not that men haven't criticised her, Bill Heffernan a National Party Senator labelled Julia Gillard ‘deliberately barren' and unqualified for leadership because she had no children. If it was a man in the same position it would have simply been said he had no children. Perhaps we are not as removed from the times when women were thought to be submissive, stayed home had children and looked after their family as we think we are. Maybe Helen Reddy should dust off her vocal cords and bring out a new song. I am a bloody strong woman, instead of just ‘I am woman'. Yet history is full of stories of strong women, so why do we still have these hang-ups about women who get up and challenge for high office and will brook no one denying them the chance. We are still uncomfortable with women who decide that don't want to have children. To a lesser extent we are with men who make the same decision. We'd better get used to strong women who want to bang the heads of people who get in their way. There are a lot more Julia Gillards out there.